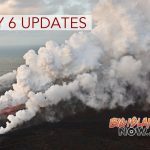 This video was released by the Hawai‘i Fire Department of a flyover of the East Rift Zone on Thursday, July 5, 2018. 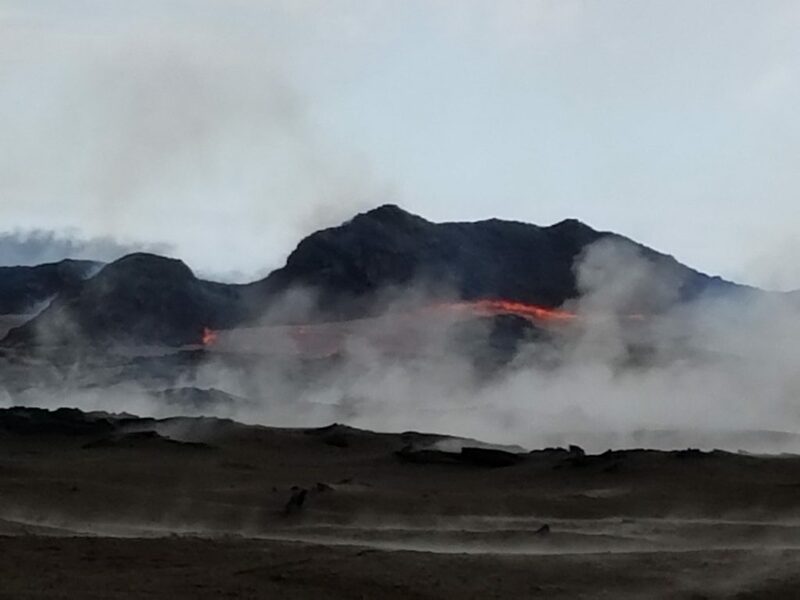 The U.S. Geological Survey released these photos of the East Rift Zone on Thursday, July 5, 2018. Having crusted over about 0.5 miles upchannel from the ocean entry, lava oozes from the flow’s molten interior to enter the sea along a broad flow front on the northern (Kapoho) side of the flow. 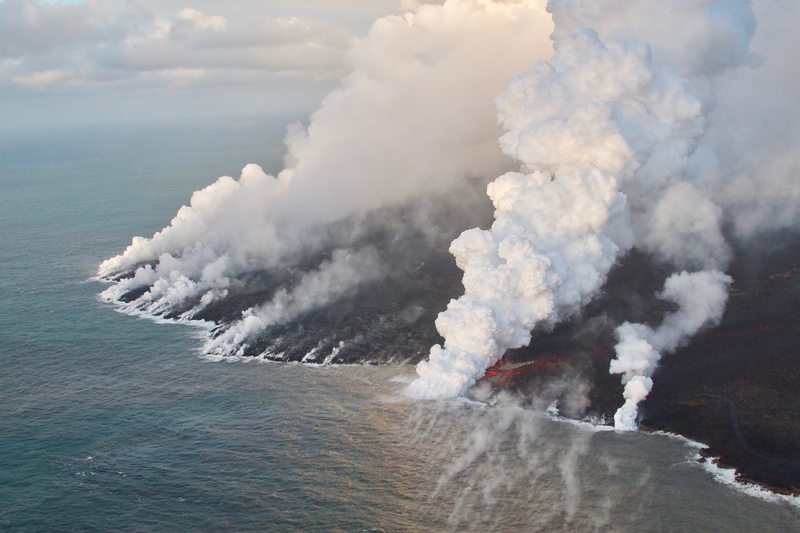 Lava enters the sea along the Kapoho coastline, building a delta that is now over 555 acres in size. 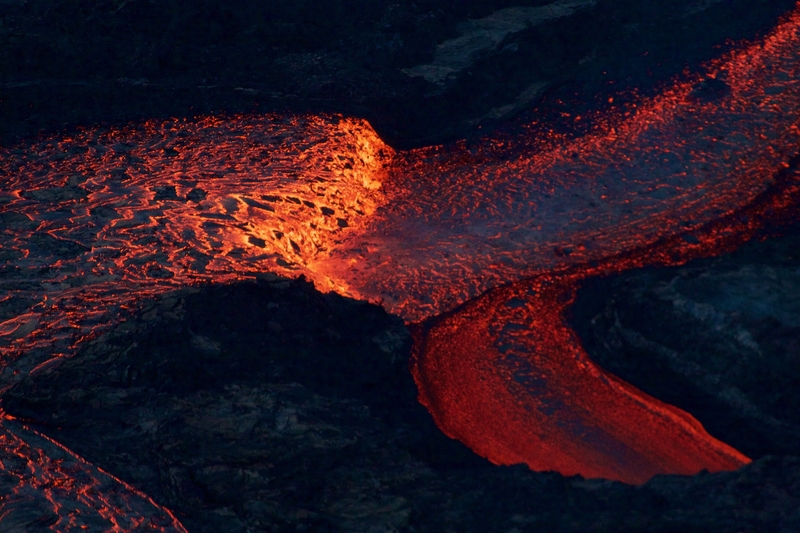 Lava, from small overflows, cools and congeals along the banks of the lava channel to build lava levees. 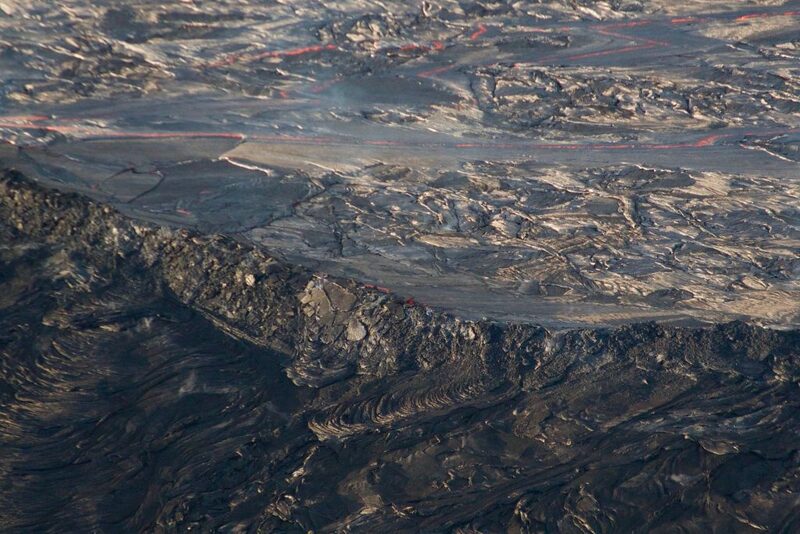 This image of the lava levee and perched lava channel were taken during the morning helicopter overflight of the lower East Rift Zone, in the vicinity of Luana and Kahukai streets, in the Leilani Estates subdivision. The lava levee is the rampart in the middle of the image with small spillovers and lava crusts visible on the levee walls. The active lava channel is the silver-colored flow with lines of visible incandescence in the upper part of the image. 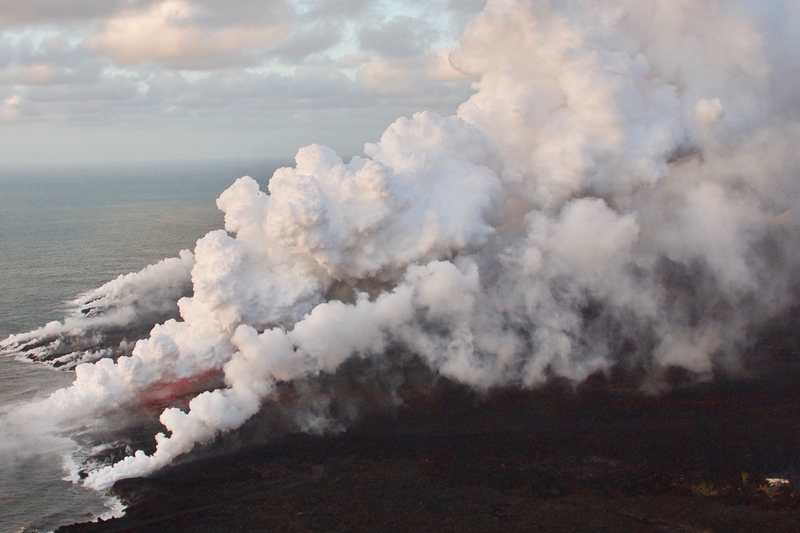 Aerial view of the lava channel and active margins between Kapoho Crater (upper right) and the coast (lower left). Image courtesy of Hawai‘i County Fire Department. The northern margin of the flow field is advancing at several points in the area of Kapoho Ag and Beach Lots (vegetated areas in center of image). Image courtesy of Hawaii County Fire Department. Near the Kapoho Crater, in the area called Four Corners, the lava channel makes a 90-degree bend. 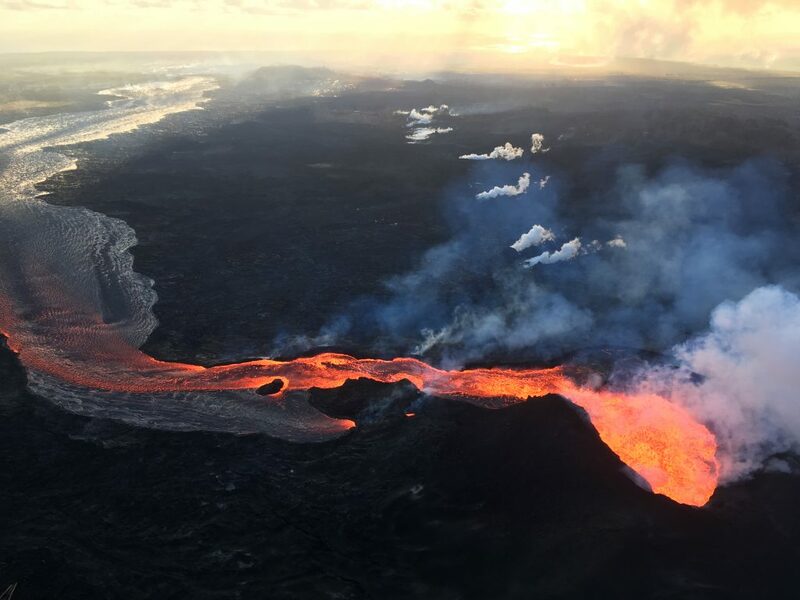 After lava exits the bend, it makes a short drop to form a lavafall. A side channel makes a short surface diversion before rejoining the existing channel. The Puna Geothermal Ventures plant can be seen in this picture.